Although rotifers comprise a small group, they are important in freshwater environments because their reproductive rates are the fastest among the metazoans; they often reach high population densities, and form a critical link in some freshwater food webs (Kaya & Altindag 2007). Rotifers also are known to be an important link between the microbial loop and higher trophic levels, but the magnitude of their contribution to this aspect of aquatic trophic food webs is not well known (Bekleyen 2003). Certain rotifer species are thought to have an important character in energy shifting from producers to consumers, and indicating the quality and eutrophication levels of the water (Ustaoglu et al., 2004). Rotifers colonize habitats rapidly and in doing so convert primary (algal and cyanobacterial) production into a form usable by secondary consumers (e.g., cladocerans, copepods, insect larvae, and planktivorous fishes) (Wallace et al. 2006 and Sharma 2009). Gurney (1921) was the first to identify some zooplankters and benthos from the mouth of the Shatt Al-Arab River to the city of Amara on the Tigris River; He found 77 taxa belonging to Rotifera, Cladocera and Copepoda. Al-Saboonchi et al. (1986) investigated the seasonal changes in the quality and quantity of zooplankton in Garmat Ali marshes; they identified 21 genera belonging to three groups, Rotifera, Cladocera and Copepoda. The Rotifera of Southern Iraqi Marshes was intensively studied (Ahmed & Mohammed 2006, Salman et al. 2008, Ahmed & Ghazi 2009). However, there was very limited information on the Rotifera of the Shatt Al-Arab River. The Rotifera of Iraq is largely unknown (Póltorak et al. 2001 and Ahmed & Ghazi 2009). Sabri (1988) studied the ecology of Rotifera in the Tigris River. Previous investigations in the Shatt Al-Arab River indicate the presence of 11 species of brachionid rotifers (Abdul-Hussein et al. 1989). The relationship between Phytoplankton, nutrients, chlorophyll a and rotifers were previously studied in some locations of Shatt Al- Arab River (Ali & Abdullah 1999). Ahmed et al. 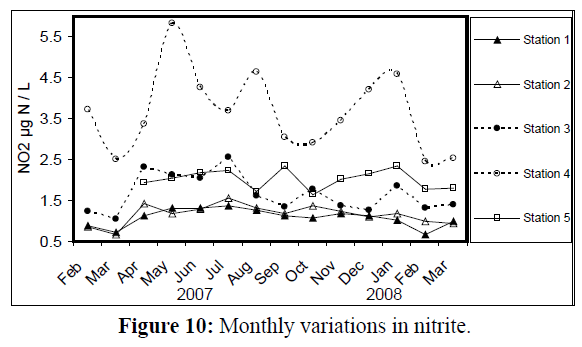 (2005) monitored the monthly changes of nutrients, chlorophyll a and Rotifera in the northern part of the Shatt Al-Arab River and recorded 23 species. Ghazi & Ahmed (2008) studied the abundance and diversity of rotifers in ponds in Garmat Ali region and recorded 26 species. Ali & Ghazi (2008) investigated the Rotifera of Shatt Al-Arab from Qurna to Fao through 12 months and listed only 47 taxa and Salman et al. (2008) listed 105 species of Rotifera from the Southern Iraqi marshes. Moreover Hammadi & Bielanska-Grajner (2012) listed about 85 taxa of Rotifera from Shatt Al-Arab. Finally, Hammadi et al. (2015) identified 56 taxa from 25 stations in the Southern Iraqi marshes. The present study provides general background on the ecology of Rotifera of Shatt Al-Arab River, to establish a keystone to the ecology of Rotifera of the region. Shatt Al-Arab River is formed by the confluence of the Tigris and Euphrates Rivers at Al-Qurna town, with a length of about 195 km and varies in width from 0.4 to more than 2 km at Al-Fao town, but may narrowed at certain places to about 200 meters. The depth of the River is ranging between 8 and 15 meters depending on the location and the phase of tide and it increases toward the Arabian Gulf. Shatt Al-Arab River has three tributaries, these are: Al-Soweab River which is coming from Al-Huwaizah Marshes, Garmat Ali River which is arising from Al-Hammar Marshes and Karun River which is coming from the east, and enters Shatt Al-Arab, about 35 km south of Basrah City and is closed recently by Iran. There are many small channels connected with Shatt Al-Arab at Basrah such as Al-Rabat, Al-Khandaq, Al-Ashar and Al-Khorah Creeks which are passing through heavily populated areas and receiving untreated disposals mainly domestic sewage. The Shatt Al-Arab River water level changes twice a day. Therefore, its water quality is affected by the semi tidal rhythm of the Arabian Gulf, with a tidal amplitude of about 1.5m decreasing during the flood season to up to 25 cm. Five stations were selected in the present study (Figure 1); stations 1, 2, and 3 are in the main River channel. Station 1 is located near Khalid Bridge (southern junction of Shatt Al-Arab and Garmat Ali rivers) at 30°34´ 36.13? North, 47°46´ 27.83? East. It is characterized by fast water currents and limited amount of organic pollutants. Station 2 is located near Basrah Silo (30°32´ 53.18? N, 47°49´ 08.65? E). This site is characterized by continuous mixing and the bottom is muddy and receives a small amount of organic pollutants. Station 3 is located near Tanoma Bridge (30°31´ 20.16? N, 47°50´ 34.30? E), this station is affected by sewage coming from side branches like Al-Ashar and Al-Khandaq creeks. The movement of water is slow to medium. Station 4 is at Khirtrad creek which is one of several small canals of the Garmat Ali River, located at 30°33´ 35.24? North and 47°45´ 05.03? East. It is about 1 km long, 10 m wide, with a depth ranging between 0.4 and 1.5 m. This station is receiving large flux of organic pollutants and sewage and the water is almost stagnant, which helps in the deposition of organic materials in high densities, and is rich both in emergent and submerged macrophytes, occurring on both sides and inside the canal, especially in the warmer months of the year. These provide shelters for many aquatic invertebrates and some juvenile fish. Vegetations popular on the banks are: Typha domingensis, Phragmites australis, Cyperus iongus, whereas Vallisneria spiralis, Potamogeton lucens and Ceratophyllum demersum were dominant in the deeper areas. Station 5 is a small permanent pond located near the College of Engineering (30°34´ 13.96? N, 47°44´ 54.63? E) at Basrah University Campus of Garmat Ali, with an area of about 1500 m2 and a depth of 0.5-1.5 m. Some of the above - mentioned species of plants were also growing in this pond. 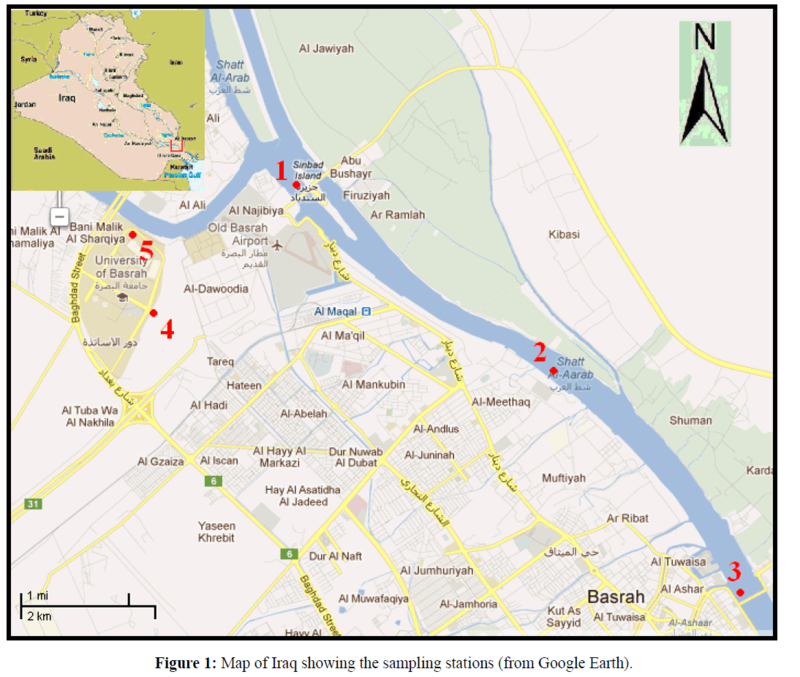 Figure 1: Map of Iraq showing the sampling stations (from Google Earth). Monthly water samples were collected from the 5 stations by hand from near the surface using a 2-liter polyethylene container for the period from February 2007 to March 2008. Air and Water Temperatures, depth of water, current velocity, salinity,pH, dissolved oxygen, total dissolved solids, total solids, nitrite, nitrate, phosphate, silicate and light penetration were measured according to the Standard Methods (APHA, 2005; Parsons et al., 1984). Total number of phytoplankton was estimated using the method of McNab (1960) modified by Maulood & Boney (1980). One liter of each sample was immediately preserved with 4% Formalin solution, and the result was expressed as ind/L. Chlorophyll a was estimated following the procedure of Lind (1979). where h is the depth of water in meters, and the numbers of Rotifera (individuals/L) was then obtained (APHA, 2005). In the laboratory, 1 mL of the sample was taken from the concentrated plankton sample (e.g. 100 mL) and poured into a Sedgewick Rafter and counted. Subsampling was repeated until enough rotifers and other zooplankters (100 individuals or more) were enumerated for representative quantitative counts. The results of the physical, chemical and biological parameters at all stations have been treated using two statistical programs, SPSS version 16 and The Multivariate Analysis of Ecological Data (CANOCO). The test of significance of the differences between stations was applied using Duncan test. The correlation coefficient was calculated between some environmental factors studied and the abundance of Rotifera. All these tests were conducted at the 5% probability level. The various ecological indices were calculated, these are: diversity index (Shannon-Weaver, 1949), richness, (Margalefe, 1968), evenness (Pielou, 1977) and Jaccard's index (Jaccard, 1908). Water temperature at the five stations showed clear seasonal variation, and was similar at all the stations. It was ranging from 11 °C (in January 2008) to 34 °C (in August 2007) (Figure 2). Changes in water currents at the first three stations exhibit pronounced monthly changes. Values were ranging from 0.09 (in August 2007, station 2) – 0.57 m/sec (in September 2007, station 1), (Figure 3). Whereas stations 4 and 5 were semiclosed or closed areas and the former is only affected by tidal cycles. Station 5 is only affected by wind since it is an enclosed shallow pool. Figure 4 illustrates the monthly fluctuation in light penetration at 4 stations in the Shatt Al-Arab region, obtaining readings from station 4 was rather difficult. The values were fluctuating between 14 (in June 2007, station 5) and 162 cm (in January 2008, station 1). 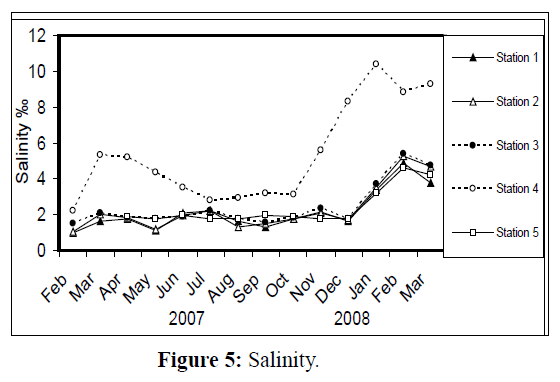 Salinity was changing from 0.96% (at station 1, in February 2007) to 5.41% (at station 3, in February 2008), station 4 exhibit the highest salinity value (10.39%) in January 2008 (Figure 5). 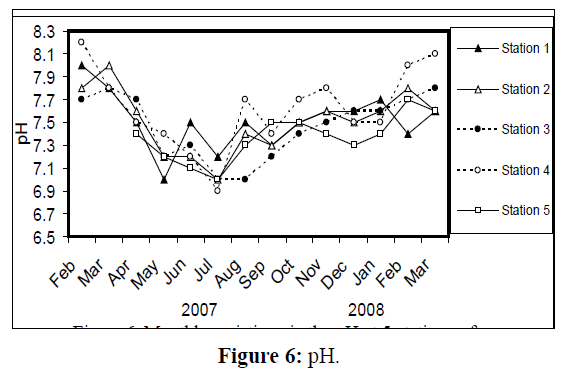 pH was alkaline in February and March 2007, and nearly neutral in the rest of the year (Figure 6). Values at station 4 ranged from 6.9 in July 2007 to 8.2 in February of the same year. 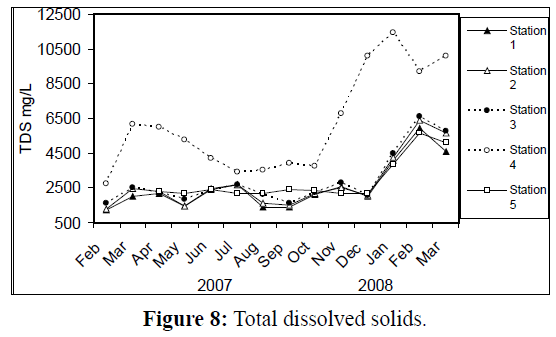 Dissolved oxygen values fluctuated between 4.8 mg/L in July 2007 at station 4, and 10.3 mg/L in January 2008 at station 1 (Figure 7). Seasonal fluctuations in TDS were generally higher at station 4. Values ranged from 1231 mg/L at station 1 in February 2007 to 11431 mg/L at station 4 in January 2008 (Figure 8). Monthly total solids fluctuated greatly at station 4 than the rest of stations (Figure 9). Values ranged from 1490 mg/L in February 2007 at station 1 to 13886 mg/L in January 2008 at station 4. Figure 2: Monthly variations in water temperature. 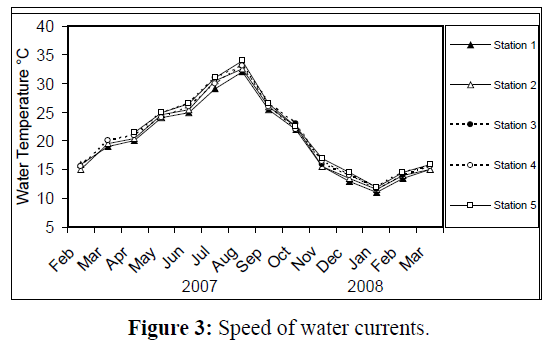 Figure 3: Speed of water currents. Figure 8: Total dissolved solids. Values of nitrite (NO2) changed from 0.65 μg atom N/L at station 1 in February 2008 to 5.84 μg atom N/L at station 4 in May 2007 (Figure 10). Nitrate (NO3) values ranged from 7.43 μg atom N/L at station 1 in July 2007 to 53.4 μg atom N/L at station 4 in September of the same year (Figure 11). 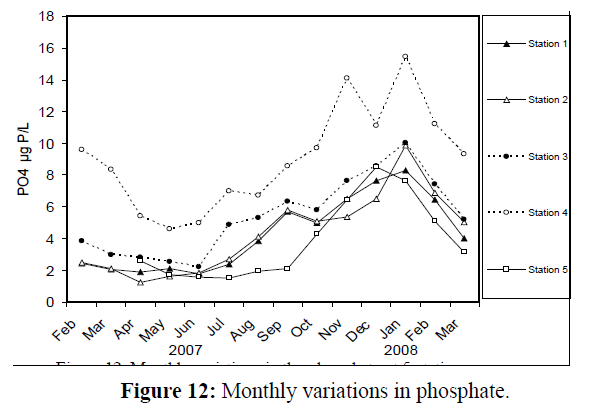 Figure 12: Monthly variations in phosphate. 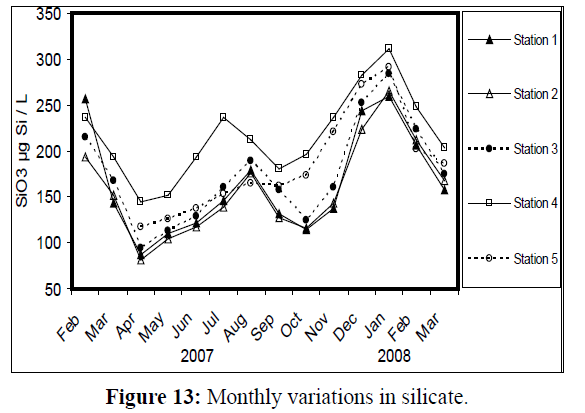 Figure 13: Monthly variations in silicate. A bimodal peak of phytoplankton density was obvious at all stations (Figure 14), so as Chlorophyll a concentration (Figure 15). The first peak of phytoplankton density occurred in May at stations1-4 (max. 3.62×106 cell/L, at station 3), whereas at station 5 it occurred in June. Chlorophyll a concentration behaved in the same way (max. 26.61 mg/m3, at station 3), with a peak at station 5 in June. The second rise in phytoplankton density, however, exhibited in September at stations 1, 2 and 5, and in October at stations 3 and 4, so as Chlorophyll a. The lowest density of phytoplankton occurred in January (min. 0.13×106 cell/L at, station 5), except at station 3 (in February). 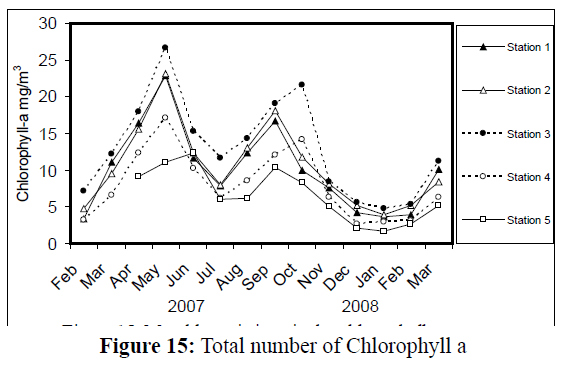 The lowest value of Chlorophyll a was recorded at all stations in January 2008 (min. 1.73 mg/m3, at station 5), except at station 4 which occurred in December 2007. Figure 14: Total number of phytoplankton. Monthly fluctuations in the total numbers of zooplankton ranged from 1.36 (the lowest value) – 84; 3.33 – 48.94; 3.18 – 91.99; 56.58 – 562.51 and 44.11 – 836.31 ind. /L (the highest value) at stations 1, 2, 3, 4 and 5, respectively. Statistical analysis of the total number of zooplankton by stations revealed that stations 1, 2 & 3 are not significantly different from each other, but they were significantly varied (p < 0.05) from the other two stations (4 and 5) (Table 1). 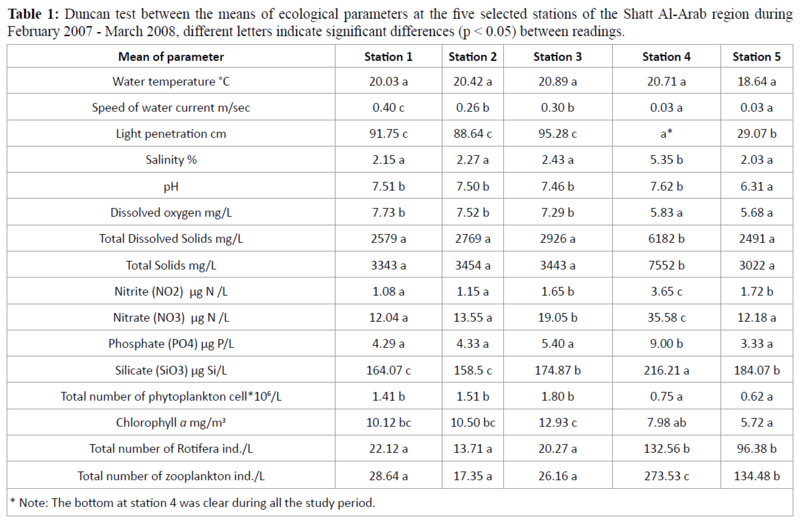 Table 1: Duncan test between the means of ecological parameters at the five selected stations of the Shatt Al-Arab region during February 2007 - March 2008, different letters indicate significant differences (p < 0.05) between readings. At station 2, of the Shatt Al-Arab River, Rotifera was the most abundant group of zooplankton all the year round (Figure 16), so as at stations 1 and 3, except in March 2008, and at station 5 except in November 2007 and February 2008, whereas station 4 had the least number of Rotifera. However, the percentage of total density of zooplankton at all stations indicates a remarkable resemblance with that of Rotifera, except at station 4 (Figure 17), with the highest percentage density of Rotifera at station 3 (69%) and the lowest at station 4 (41%). 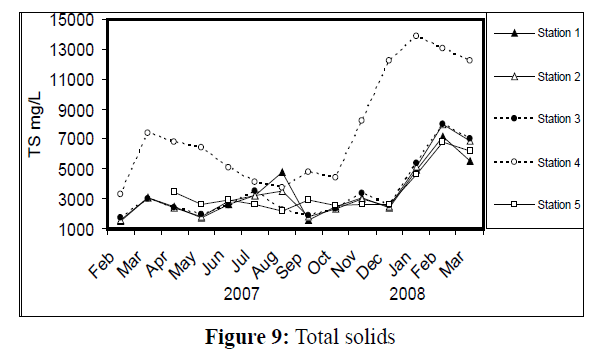 Figure 16: Monthly percentage of zooplankton groups at each station in the Shatt Al-Arab region during February 2007 – March 2008. Figure 17: Percentage mean total density of zooplankton at five stations of the Shatt Al-Arab region during February 2007 – March 2008. Monthly changes in density of Rotifera in Shatt Al-Arab region during February 2007 to March 2008, were ranging from 1.09-76.00; 1.81-44.71; 1.37-89.05, 22.22-307.76 and 20.16- 650.99 ind./L at stations 1-5, respectively (Figure 18). Significant differences (p<0.05) were found in the total number of Rotifera between stations 1, 2, 3 and stations 4 and 5 (Table 1). 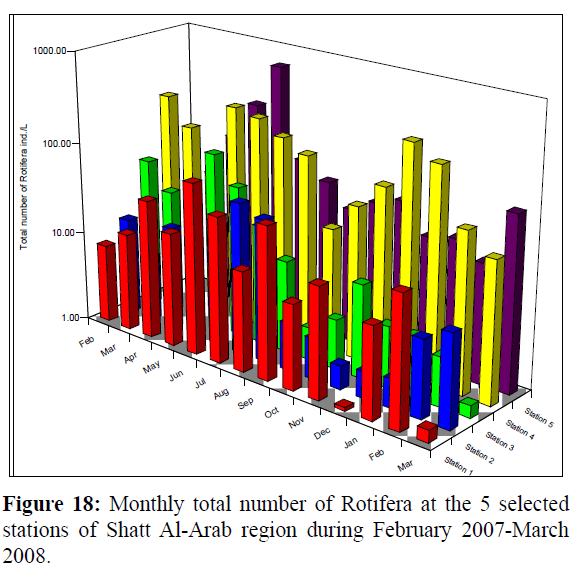 Figure 18: Monthly total number of Rotifera at the 5 selected stations of Shatt Al-Arab region during February 2007-March 2008. A bimodal distribution of Rotifera density was evident at station 4, with peaks attained in May (241.85 ind./L) and December (307.76 ind./L). The total densities of Rotifera were 279.77, 206.47, 304.7, 1492.6 and 1210.3 ind./L at stations 1, 2, 3, 4 and 5, respectively (Table 2). Table 2: Densities (ind./L) of 30 common taxa of Rotifera, at the 5 selected stations of the Shatt Al-Arab region during February 2007- March 2008. Out of the 99 species identified in the present study, Rotifera species within top 30 were selected according to their total counts or frequency (Table 2). Five of these identified taxa were exceptionally high in density at stations 4 and 5, these are: Bdelloidea, Brachionus angularis, Notholca squamula, Synchaeta lakowitziana and Synchaeta spp. (Table 2). Four genera comprised the highest number of species. These are: Brachionus (17 species), Keratella (14), Lecane (13) and Cephalodella (8). Few species were specific in their occurrence to certain station. These are: Proales sp., T. rattus, Trichotria tetractis at station 1;B. quadridentatus (long posterior spines form), L. crepida, L. pyriformis and Rotaria sp. at station 2; K. valga f. heterospina and L. stenroosi at station 3; C. megalocephala, C. reimanni and Lepadella (L.) patella persimilis at station 4; and Anuraeopsis sp., B. budapestinensis, B. calyciflorus f. calyciflorus, B. rubens, C. dora, C. gibba, C. tantilloides, K. tecta and L. obtusa at station 5 (Table 2). Analysis of the correlation coefficients between some species of Rotifera and the environmental parameters using Canonical Correspondence Analyses (CCA) (Figure 19) was carried out. Ordination showed that the numbers of dominant species of Rotifera were related to the total solids, nitrite, temperature, chlorophyll a and total number of phytoplankton. 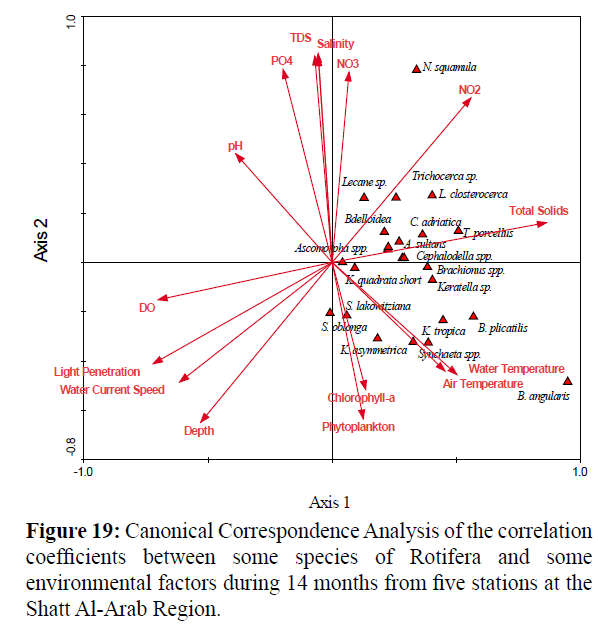 Figure 19: Canonical Correspondence Analysis of the correlation coefficients between some species of Rotifera and some environmental factors during 14 months from five stations at the Shatt Al-Arab Region. Positive significant relationships were observed between Bdelloidea and total solids (r = 0.265), nitrite (r = 0.637) and salinity (r = 0.263), and negative significant relationships were obtained with the speed of water currents (r = - 0.397) and light penetration (r = - 0.478). A positive significant relationship was found between Colurella adriatica and nitrite (r = 0.500) and negative significant relationships with the speed of water currents (r = - 0.330) and light penetration (r = - 0.340). Values of Diversity Index of Rotifera ranged from 0.82 – 2.45; 0.57 – 2.29; 0.68 – 2.43; 0.29 (the lowest) – 2.46 and 1.19 –2.66 (the highest) at the 5 stations, respectively (Figure 20). Monthly variations in Richness (D) of Rotifera fluctuated between 1.30 and 9.65 (the highest value); 1.53 and 6.88; 1.31 and 6.33; 0.55 (the lowest value) and 2.98 and 1.54 and 3.86 at the 5 stations, respectively (Figure 21). Evenness (J) changed from 0.46 to 0.96; 0.52 to 0.95; 0.28 to 1.00 (highest value); 0.13 (lowest value) to 0.97 and 0.48 to 0.93 at the 5 stations, respectively (Figure 22). Figure 23 illustrate the Jaccard's index of Rotifera. 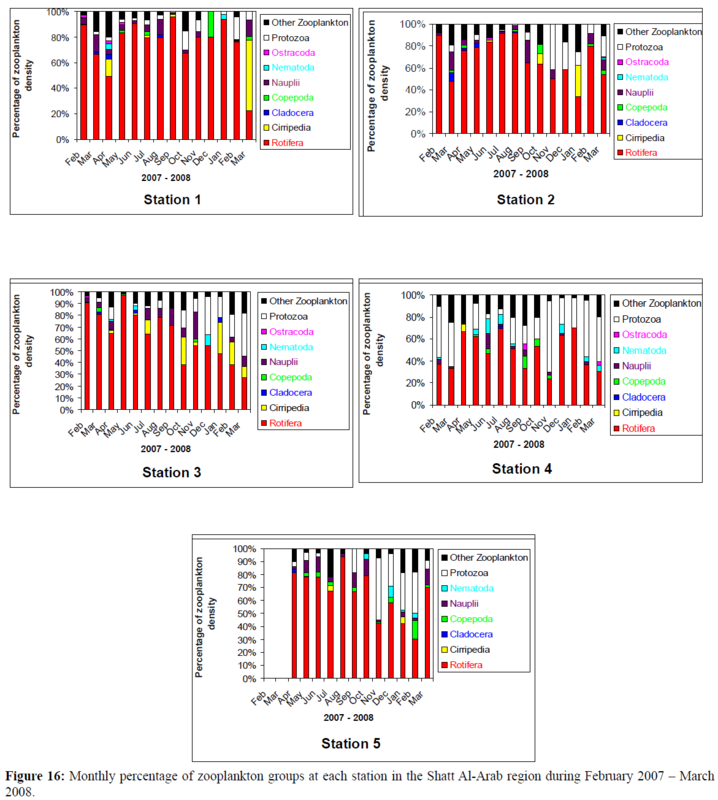 The highest similarity value (35.54) was between stations 1 and 2 and the lowest (20.66) between stations 4 and 5. Figure 20: Monthly variations in Diversity index. Figure 21: Monthly variations in Richness. Figure 22: Monthly variations in Evenness. 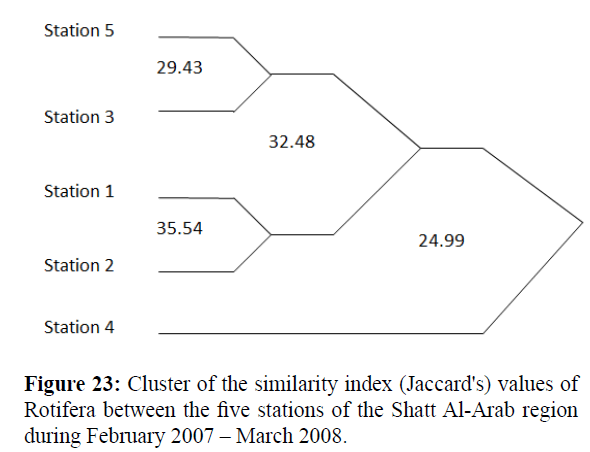 Figure 23: Cluster of the similarity index (Jaccard's) values of Rotifera between the five stations of the Shatt Al-Arab region during February 2007 – March 2008. It is evident from the present findings that water temperature is significantly correlated with chlorophyll a (r=0.96). It is well known that water temperature plays a substantial role in adjusting productivity in aquatic ecosystems (Wallace et al., 2006). Moreover, temperature has a pervasive controlling effect on the rates of both food consumption and metabolism (Weatherly and Gill, 1987). Abundance of phytoplankton and chlorophyll a may explain the decline in transparency recorded in the warmer periods (Al-Saadi et al., 1996). The negative impact of decreasing light penetration on zooplankton in various types of lakes is a known fact that manifests itself in a depressed zooplankton standing stock, lowering feeding rate of consumers, accelerating respiration rate, and increasing settling (Póltorak et al., 2001). The present results emphasized that the influx of water from the main river in spring led to an acute drop in zooplankton numbers. This might be due to two factors: high turbidity (Secchi disc visibility was 0.2 m) and strong water current which carried the plankton towards the middle section of the water (Póltorak et al., 2001). It should be noted, however, that after a drop in the amount of the influx water, the zooplankton recovered very rapidly. The present results indicated that salinity values of Shatt Al- Arab region were higher than those recorded previously (Al-Saadi et al., 1979, Al-Mosawi et al., 1990 and Al-Mosawi, 1992), but it was lower than those recorded later in the region (Al-Noor et al., 2009). This was due to fluctuations in the water discharge set by Turkey and Iran into the Tigris and Euphrates Rivers. TS and TDS values were generally low from April to October due apparently to a rise in water temperature which induced a reduction in water viscosity and consequently increasing sinking rate and settlement of suspended matters (Hynes, 1972). DO values were generally high during November-February, then declined gradually, and the pH is at most of the times alkaline. Nutrient concentrations were never limiting for phytoplankton. In the present study, Bacillariophyta were the most dominant group of phytoplankton. This is a distinctive feature of Iraqi freshwater bodies, and is in accordance with the results of Veeresha & Hosmani (2006) on two lakes in India. Monthly changes in chlorophyll a concentrations were usually coincided with the monthly trend in total number of phytoplankton. This result corresponds with that of Jassim et al. (2008). However, Kowalczewski & Lack (1971) pointed out that the seasonal variation in the content of chlorophyll a occurred during or after the phytoplankton blooming. On the other hand, Heyman & Lundgren (1988) suggested that chlorophyll a contents of algae increase three to five times with the rise in temperature, light intensity and nutrients. However, Ahmed et al. (2005) reported a value of chlorophyll a of 40 mg.m-3 at station 1, which is very much higher than that recorded here (max. 23 mg.m-3). Zooplankton economically support fish population and they are the major mode of energy transfer between phytoplankton and fish, hence, the study of zooplankton composition, abundance and seasonal variations is helpful in planning and successful fishery management (Kiran et al. 2007). Among zooplankton samples collected in the current study, rotifers were the dominant group. Similar findings were also observed by most local inland water zooplankton studies (e.g. Ahmed et al. 2005 and Salman et al. 2008). Moreover, Póltorak et al. (2001) claimed that rotifers, constituted more than 90% of the total zooplankton. One factor that could possibly aid in rotifer dominance is the composition of the predator community at the studied stations (Burnes 2006). Shatt Al-Arab region contains many long-life planktivores; these predators selectively feed on zooplankton. The numerical variation in the peak periods of different groups of zooplankton might be due to different biological parameters, and numerical variations in rotifers may be influenced by water quality (Kiran et al. 2007). Rotifers are now being used as an important aquatic faunal component for biomonitoring, as they are good indicators of saprobity (Sládecek 1983). In the context of articles published to date regarding studies on Rotifera in the region of the Shatt Al-Arab River (Abull-Hussein et al. 1989, Ali & Abdullah 1999, Ahmed et al. 2005 and Ghazi & Ahmed 2008), and in comparison with Rotifera investigations from other water bodies in Iraq (Al-Saboonchi et al. 1986, Póltorak et al. 2001, Ahmed & Mohammed 2006, Al-Sodani et al. 2007 Salman et al. 2008, Ahmed & Ghazi 2009 and Hammadi et al. 2015), the list of taxa of Rotifera found during the current study is truly impressive. For between February 2007 and June 2008, about 99 taxa, belonging to 25 genera and 17 families were identified from Shatt Al-Arab region. Of these, 37 taxa were Brachionidae, 13 Lecanidae and 8 Notommatidae beside some other taxa (30) of the rest of families of Rotifera. Segers et al. (2004) in their study on the floodplain of the Mun River, Northeast Thailand, identified 184 species, most of them belonging to Lecane (31%), followed by Trichocerca (12%), Lepadella (11.4%) and Brachionus (8.2%). Furthermore, the highest densities of zooplankton, in general, and of Rotifera, in particular, recorded here were not reported before in the south of Iraq. The present study, demonstrated that the population density of Rotifera as well as that of zooplankton at the main River increased during the warmer months and decreased in the colder period. This result is supported by the positive correlation between density of Rotifera and water temperature (r = 0.62). Meanwhile, an inverse relation between the speed of water currents and density of Rotifera was found (r = - 0.56). Arora & Mehra (2003) while analyzing the seasonal dynamics of rotifers in relation to physico-chemical conditions of lotic water body reached similar conclusion. In summer, the absence of inflow of water brings stability to the water body, and the availability of food is more due to production of organic matter and decomposition, hence, contributing to the high species density in that season (Kiran et al. 2007 and Chattopadhyay & Barik 2009). The presence of waste water treatment unit at station 4 (Khirtrad Creek) may play an effective role on the community of Rotifera through the discharge of waste water from Basrah University Campus to the Creek. Therefore, nutrients levels at this station were higher than those recorded in the other stations, this enhance macrophytes contribution in absorption of nutrients from the water column (Hussain & Grabe 2009), and increase competition between phytoplankton species and explain why chlorophyll a concentrations and phytoplankton biomass at station 4 were lower than those of the main River. In addition, the diversity of macrophytes increase the number of ecological niches for rotifers, and species richness of rotifers is directly related to plant density, regardless of the number of plant species (Bielanska-Grajner & Gruszka 2008). On the other hand, although the increase of nutrients concentrations may have a positive role upon the phytoplankton biomass, there is a possibility that it may inhibit rotifers as well as other zooplankters growth (Ahmed et al. 2005). Whereas, moderate concentrations of particulate organic matter may resulting in higher production, for example, Sarma & Nandini (2002) reported that Brachionus calyciflorus did not maintain the population beyond a few days when growing in inorganically rich waste water in Mexico's largest food processing industrial sector which contains both particulate and dissolved matter of a concentration of 16-32%, whereas, at a diluted concentration (8%) high population density of rotifers was obtained. Furthermore, they obtained a maximum density when using two food combinations (diluted organic and algal foods). In the light of these data, it is possible to conclude that the higher densities of rotifers obtained at station 5, may corresponds with the moderate concentrations of nutrients prevailing at this station compared to the other stations. The present results indicated that stations 1 and 2 were closely similar to each other, and the least similarity was obtained between stations 4 and 5. Similarity of water bodies is indicative if the value of the Ss% coefficient is greater than 50% (Póltorak et al. 2001). 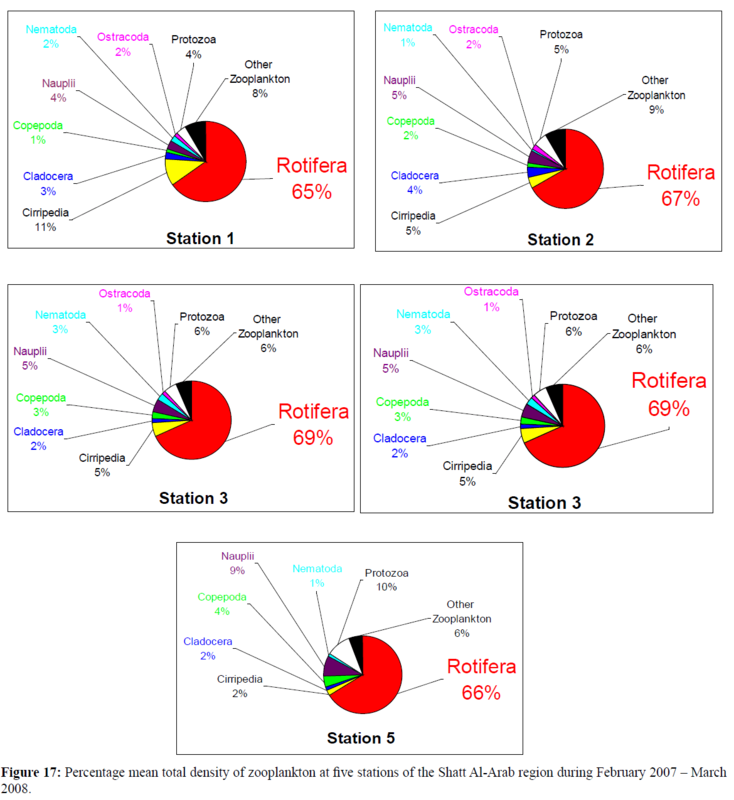 The faunal similarity coefficients computed for these stations showed that the community of Rotifera at stations 4 and 5 differ from those of stations 1, 2 and 3. The five stations had 30 taxa of Rotifera in common. When compared with North African freshwater Rotifera (De Ridder 1987, 1991), Rotifera of Southern Iraq apparently dominated by ubiquitous and eurytrophic species that occur in fresh and saline waters with varied trophic states. However, most species in the present study are cosmopolitans (Arora & Mehra 2003, Yalim 2006 and Segers 2007). In addition, euryhaline Rotifera, particularly of the genera Lecane and Brachionus, were noted to occur at all stations, Brachionus angularis periodically dominated the Rotifera at station 5, and the euryhaline Synchaeta occurred constantly and in large numbers at most of the stations. Generally, station 5 differed in abundance and community structure of Rotifera. The total numbers of individuals at station 5 were higher than those of the other stations, as zooplankton in general and Rotifera in particular, prefer to live in standing water (Wallace et al. 2006). Moreover, Brachionus angularis was dominant throughout the year, and reach a density of 538.94 ind./L at this standing water station. However, at station 4 the densities of Notholca squamula and bdelloid rotifers were 448.63 and 206.96 ind./L, respectively, meanwhile the minimum value of the monthly mean of richness was 1.63 at this station. This emphasize that as salinity increases, the abundance and species richness of rotifers and microcrustaceans generally decrease, as the threshold for the majority of microzooplankton organisms has been placed at salinities of less than 1–2 ppt (Schabetsberger et al. 2009). Most of the species like Lecane hamata, L. lunaris and Lepadella ( L.) patella, live in the littoral zone, inhabiting the aquatic macro-vegetation (Yalim 2006). Whereas other species for instance, Brachionus urceolaris and C. gibba, live in the benthos. All taxa except Notholca acuminata (this species is cold stenothermous) are thermophilic and tolerant to considerable variations in pH, temperature and dissolved oxygen (Yalim 2006), though this species has been found in Shatt Al-Arab Region (warm water), but only during winter, hence, supporting other results in this context (Sládecek 1983 and Dumont & De Ridder 1987). Among rotifers, Brachionus plicatilis (Müller) is probably one of the best studied monogonont species. It has been widely used as a model for physiological, ecological, and ecotoxicological studies, as well as being world widely employed in marine aquaculture. This taxon has recently been recognized as a complex of several sibling species (Ciros-Pérez et al. 2004). Two of these species, differing in body size, have already been formally described (i.e., B. plicatilis Müller, B. rotundiformis Tschugunoff). These species are common in Shatt Al-Arab region. In addition, it is important to note that Synchaeta lakowitziana, had high density at nearly all the stations but it hasn't been recorded in the region before. A sample taken at station 5 (pond) on June 2007, had a total number of 650.99 ind./L of Rotifera and generally 836.31 ind./L of zooplankton, required special attention. This was the highest value ever found during the course of the study, in Shatt Al-Arab River as well as in Iraq as a whole (Table 3). It is suspected that this is due to the natural tendency of Rotifera to form agglomerations, together with the wind action driving the zooplankton towards one side of the pond (Póltorak et al. 2001). Das et al. (2005) demonstrated that postmonsoon zooplankton population is higher than premonsoon zooplankton population in the brackish water wetlands of Goa, India. Cases like this are probably very rare, can periodically result in good food conditions for planktivorous fish (Póltorak et al. 2001). Table 3: A comparison of zooplankton data between the present study and previous records of Iraqi rivers and marshes. The Shannon-Weaver diversity index indicates that community structure in some of the studied stations was different, with the highest value at station 5, and the lowest at station 3. This is probably attributed to the difference in the environmental conditions between station 5, which is a standing water environment, and the rest of stations which are running water bodies. Therefore, every station had its own community of Rotifera. The community structure of rotifers at station 1 was similar to that at station 2, while that of station 5 was completely different from those of the other stations. The high species diversity is probably also due to the season in which these habitats trap the resting eggs carried by water from higher elevations, especially during increased flows as evidenced by the presence of Notholca acuminata (cold stenotherm species) whose existence in Shatt Al- Arab can be attributed to it being drifted downstream from higher elevations (Arora & Mehra 2003). Biodiversity assessments of any water body depend on the ability to identify the complement of species present, although the degree of sampling required is often uncertain (Muirhead et al. 2006). Rotifera dominated the zooplankton at all the stations, about 99 taxa, belonging to 25 genera and 17 families were identified from Shatt Al-Arab region. Most species in the present study are cosmopolitans. Synchaeta lakowitziana, had high density at nearly all the stations but it hasn't been recorded in the region before. Peak density of Rotifera recorded at station 5 which is the highest value ever recorded from any aquatic habitat at the Southern Iraqi wetlands. This work was supported by a scholorship from the College of Agriculture to N.S.H, N.S.H. would like to thank Prof. Dr. Hendrik Segers of the Fresh Water Laboratory, Royal Belgian Institute of Natural Sciences, Belgium and Prof. Dr. Roman Zurek of the Institute of Nature Conservation PAS, Poland for confirming the identification of Rotifera. We would like to thank the Marine Science Centre, Univ. Basrah for various supports throughout the course of the study. We are grateful to Prof. Dr. A. Y. Al-Handal for correcting the English of the manuscript. Abdul-Hussein, M. M., Al-Saboonchi, A. A. and Ghani, A. A. (1989)Brachionid rotifers from Shatt Al-Arab River, Iraq. MarinaMesopotamica,4, 1-17. Ahmed, H. K., Abdullah, D. S., and Ali, M. H. (2005) Monthly changes of nutrients, chlorophyll and Rotifera in the Shatt Al-Arab River, South of Iraq.Iraqi J. Aqua., 2, 1-11. Ahmed, H. K. and Ghazi, A. H. (2009). A taxonomic and environmental study of the genus Brachionus (Rotifera: Monogononta) (Pallas, 1776) in Al-Hammar marsh, south of Iraq. Iraqi J. Aqua.,6, 105-112. Ahmed, H. K. and Mohammed, H. H. (2006).The Rotifera community in the South Marshes of Iraq. Marsh Bulletin, 1, 54-58. Ali, M. H. and Abdullah, D. S. (1999). The biomass of rotifers in relation to the phytoplankton biomass in the Shatt Al-Arab River. Marina Mesopotamica,4, 279 – 289. Ali, M. H. and Ghazi, A. H. (2008)Rotifera composition and density along of the Shatt Al-Arab river from Qurna to Fao, Southern Iraq. Marine Science Conference, 23-25 Dec., Mar. Sci. Centre, Basrah Univ. Al-Lami, A. A. (1986) Ecological study of phytoplankton of some Marshes in southern Iraq.MSc. Thesis.Basrah Univ. 136pp. (in Arabic). Al-Mosawi, A. H., Hadi, R. A., Kassim, T. I. and Al-Lami, A. A. (1990) A study on the algae in the Shatt Al-Arab estuary, Iraq. Marina Mesopotamica, 5, 305 – 325. Al-Mosawi, N. M. (1992) Ecological study of Shatt Al-Arab Estuary at Basrah City.M.Sc Thesis, Basrah Univ., 114pp. 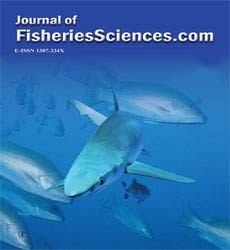 Al-Noor, S. S., Al-Dubaikel, A. Y., Resean, A. K., Taher, M. M. and Al-Naeem, K. S. (2009)The saline effects on composition, fishing rates and fish aquaculture at Basrah City. A report of the Workshop of Basrah Governorate about water decreasing and salinity increasing, 18-19 Nov. 2009: 72pp. Al-Saadi, H. A., Pankow, H. and Huq, H. F. (1979) Algological investigation in the polluted Ashar Canal and Shatt Al-Arab River in Basrah (Iraq). Int. Rev. Grs. Hydrobiol., 64, 527 – 540. Al-Saboonchi, A. A., Barak, N. A. and Mohamed, A. M. (1986) Zooplankton of Garma Marshes, Iraq. J. Biol. Sci. Res., 17, 33-40. Al-Sodani, H. M., Abed, J. M., Al-Essa, S. A. and Hammadi, N. S. (2007) Quantitative and qualitative study on zooplankton in Restored Southern Iraqi Marshes. Marsh Bulletin, 2, 43-63. APHA (American Public Health Association). (2005) Standard methods for the examination of water & wastewater.21st edition. Washington, DC. 1400 pp. Arora, J. and Mehra, N. (2003) Seasonal dynamics of the rotifers in relation to physical and chemical conditions of the river Yamuna (Delhi), India.Hydrobiologia, 491, 101-109. Bekleyen, A. (2003) A Taxonomical Study on the Zooplankton of Göksu Dam Lake (Diyarbakir).Turk. J. Zool., 27,95-100. Bielanska-Grajner, I. and Gruszka, K. (2008) Planktonic rotifer communitybefore and after restorationofLakePaprocany.Teka Kom. Ochr. Kszt. Srod. Przyr. – OL PAN., 5, 5–11. Burnes, R. M. (2006)Diel variations in the vertical distribution of zooplankton in Lake Monroe, Florida. MSc. Thesis.Florida Univ., 47pp. Chattoopadhyay, C. and Barik. A. (2009)The composition and diversity of net zooplankton species in a Tropical Freshwater Lake. International Journal of Lakes and Rivers.,2, 21-30. Ciros-Pérez, J., Carmona, M. J., Lapesa, S. and Serra, M. (2004)Predation as a factor mediating resource competition among rotifer sibling species. Limnol.Oceanogr.,49, 40–50. Das S. R., Patil, S. G. and Nandi. N. C. (2005) Zooplankton diversity of wetland ecosystems of Goa, India. J. Env. Sociobio.,2, 15–23. De Ridder M. (1987) Contributions to the knowledge of African rotifers: Rotifers from Maurtania (W. Africa) – Hydrobiologia, 150, 123-131. De Ridder M. (1991) Rotifers from Algeria. J. Afr. Zool., 105, 473-483. Dumont, H. and De Ridder, M. (1987) Rotifers from Turkey.Hydrobiol.,147, 65-73. Ghazi, A. H. and Ahmed, H. K. (2008) Abundance and diversity of Rotifera in the Garmat Ali Region Ponds, Basrah–Iraq. Iraqi J. Aqua., 5, 33-40. Gurney, R. (1921) Freshwater crustacean collected by Dr. P. A. Buxton in Mesopotamia and Persia. J. Bombay Nat. Hist. Soc., 27, 835-844. Hammadi, N. S. and Bielanska-Grajner, I. (2012).Rotifera from the Shatt Al-Arab region, Southern Iraq.Basrah J. Agric. Sci., 25, 81-92. Hammadi, N. S.; Salman, S. D. and Abbas, M. F. (2015)Rotifera of the southern Iraqi Marshes, with a reference to the major zooplankton groups in the region.Marsh Bulletin 10, 46-55. Heyman, U. and Lundgren, A. (1988) Phytoplankton biomass and production in relation to phosphorus, Hydrobiologia.,170, 211-227. Hussain, N. A. and Grabe, S. A. (2009) A Review of the Water Quality of the Mesopotamian (Southern Iraq) Marshes Prior to the Massive Desiccation of the Early 1990s. Marsh Bulletin, 4, 98-120. Hynes, H. B. N. (1972)The ecology of running water. Liverpool Univ. Press. 555pp. Jaccard, P. (1908)Nouvllesresearches sur la distribution floral. Bull. Soc. Nat. 44, 223-270. Jassim, A. Q., Hammadi, N. S. and Hussein, S. A. 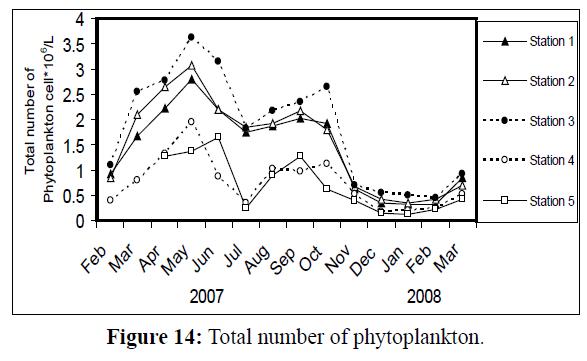 (2008)Monthly changes in phytoplankton productivity in the three restored marshes of Southern Iraq. Basrah J. Agric. Sci., 21, 37-45. Kaya, M. and Altindag, A. (2007) Zooplankton Fauna and Seasonal Changes of Gelingüllü Dam Lake (Yozgat, Turkey).Turk. J. Zool., 31, 347-351. Kiran, B. R., Puttaiah, E. T. and Kamath, D. (2007) Diversity and seasonal fluctuation of zooplankton in fish pond of Bhadra Fish Farm, Karnataka, India. Zoosprint J., 22, 2935-2936. Kowalczewski, A. and Lack, T. J. (1971) Primary production and respiration of the phytoplankton of the river. Freshwater Biol. 1, 197-212. Lind, O. I. (1979) Handbook of common methods in limnology. C. V. Mosby Co. St. Louis, 199 pp. Margalefe, R. (1968) Perspectives in Ecology.University of Chicago. Press Chicago. 111pp. Maulood, B.K. and Boney, A. D. (1980) Phytoplankton ecology of the lake of Menteith, Scotland, Hydrobiologia, 79, 179-186. McNab, C. D. (1960) Enumeration of freshwater phytoplankton concentration on the membrane filter. Limnol.Oceangr.,5, 57- 61. Muirhead, J. R., Ejsmont-Karabin, J. and Macisaac, H. J. (2006) Quantifying rotifer species richness in temperate lakes. Freshwater Biology 51, 1696–1709. Parsons, T. R., Matia, Y. and Lalli, C. M. (1984)A manual of chemical and biological methods for sea water analysis. Pergamon Press. Oxford, 360pp. Pielou, E. C. (1977) Mathematical Ecology. John Wiely, New York. 385pp. Póltorak, T., Bartel, R. and Szczerbowski, J. A. (2001)Horizontal distribution of zooplankton in Lakes Tharthar, Habbaniya and Razzazah. Arch. Pol. Fish., 9, 111 - 126. Sabri, A. W. (1988) Ecological studies on Rotifera (Aschelminthes) in the Tigris River, Iraq. ActaHydrobiol.,30, 367-379. Sarma, S. S. S. and Nandini, S. (2002) Population dynamics of Brachionuscalyciflorus(Rotifera: Brachionidae) in waste water from food-processing industry in Mexico. Revista de Biologia Tropical (San Jose).46, 595-600. Schabetsberger, R., Drozdowski, G., Rott, E., Lenzenweger, R., Jersabek, C. D., et al. (2009) Losing the Bounty? Investigating Species Richness in Isolated Freshwater Ecosystems of Oceania. Paci?c Science,63, 153–179. Segers, H. (2007)Anotated checklist of the rotifers (Phylum Rotifera), with notes on nomenclature, taxonomy and distribution.Zootaxa, 1564 Magnolia Press. Auckland, New Zealand. 103pp. Segers, H., Kotethip, W. and Sanoamuang, L. (2004) Biodiversity of freshwater microfauna in the floodplain of the River Mun, Northeast Thailand: the RotiferaMonogononta.Hydrobiologia, 515, 1-9. Shannon, C. E. and Weaver, W. 1949.The mathematical theory of communication, Univ. Illions.Press Urbane. 117pp. Sharma, B. K. (2009) Diversity of rotifers (Rotifera, Eurotatoria) of Loktak Lake, Manipur,North-eastern India. Tropical Ecology, 50, 277-285. Sládecek, V. (1983) Rotifers as indicators of water quality. Hydrobiol.,100, 169 – 201. Veeresha, K. N. and Hosmani, S. P. (2006) Algal biodiversity in freshwaters and related physiochemical factors.Nature Env.Polln.Techno.,5, 37–40. Ustaoglu, M. R., Balik, S. &Özdemir-Mis, D., (2004)The Rotifer Fauna of Lake Sazligöl (Menemen - Izmir). Turk. J. Zool. 28, 267-272. Wallace, R. L., Snell T. W., Ricci, C., andNogrady.T.,(2006)Rotifera: Volume 1 Biology, Ecology and Systematics.Guides to the Identi?cation of the Microinvertebrates of the Continental Waters of the World. No. 23 (Dumont, H.J.,ed.). Kenobi Productions, Ghent, and Backhuys Publishers, Leiden. 299pp. Weatherly, A. H. and Gill, H. S. (1987) Biology of fish growth. Academic Press. London. 212pp. Yalim, F. B. (2006)Rotifera Fauna of Yamansaz Lake (Antalya) in South-West of Turkey. J. Fish. Aqua. Sci., 23, 395–397.